Serial game-worrier Keith Vaz MP would like the British Parliament to hold a pre-Christmas debate about children and videogames. 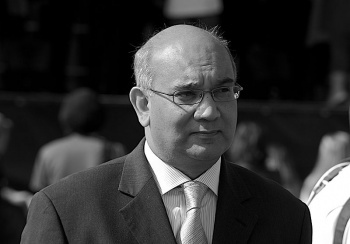 Keith Vaz, Labour MP for East Leicester, has long been trying to wake a sleepy Britain to the many "dangers" of videogames. His last target was Modern Warfare 3, which he attempted to link with the terrorist attacks in London on July 7 2005. However, not content with restricting his winter crusade to just one title, Vaz has now called for Parliament to hold a proper debate on games because parents might be considering buying them as Christmas presents for children. Addressing the House of Commons, Vaz said, "At a time when parents are thinking of purchasing video games for Christmas, does the Right Hon. Gentleman not think that it is important to hold a debate on this matter?" To ensure clarity, he added, "This is not about censorship - it is about protecting our children." Vaz supported his motion with research from the University of Indiana which suggested that violent videogames increase activity in certain parts of the player's brain, parts which some claim are connected to violent behavior. The report was an opportunity for much in the way of anti-games hyperbole but had little real impact. Sir George Young, Leader of the House of Commons, responded to Vaz's appeal by saying, "I am grateful to the Right Hon. Gentleman, and I know that this is an issue that he has pursued with vigor for some time. I cannot promise a debate next week...but in the meantime I will draw his concern to the attention of the Home Secretary." (My British Parliament-speak isn't as good as it used to be, but as far as I can tell, that's a really, really polite "probably not"). As is well known, the UK has a fairly well-built age restriction policy in place for the purchase of games. If Vaz wants this debate to better educate parents on which games are suitable for their children (bearing in mind the age restriction advice which appears on all games and the law used to enforce those restrictions) then good luck to him. But if he's only out to try and further prove that there's some kind of link between games and aggressive behavior, then prepare yourselves, British readers, for yet more eye-rolling, link-finding and hilarious Daily Mail headlines.